The "fun" part of Family Fun did not actually include my family for Day 9. My friend, Jan, over at Room With a Past invited me to visit Wendy Addison's shop, Theatre of Dreams, in Port Costa for one of Wendy's openings. We were joined by pals Rosann and Sherry. We went on the second day of the opening and Wendy mentioned that Day 1 was tres busy with many items sold out. 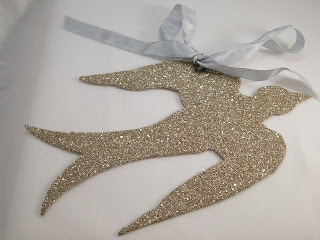 I still scored a glittery bird that I'm planning to hang in my "studio". 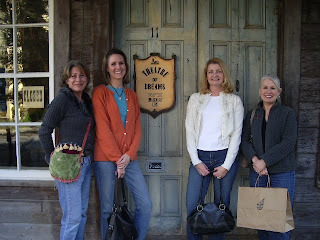 Rosann, me, Jan & Sherry outside of Wendy Addison's shop. We headed into San Francisco for our last day of Family Fun. To the Presidio to be exact. The Presidio was once a military base, but is now run by the National Parks Service. It is so very charming. We toured the Visitor's Center and right next door was a small exhibit of Andy Goldworthy's nature art. He is a fantastic artist. Click here to see photos of his work on flickr. 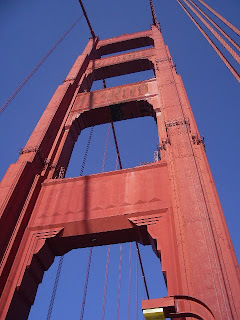 We then drove the the Golden Gate Bridge and walked half way across and back. It was a great experience. I wouldn't mind doing it again on a crystal clear day. We had a bit of fog/smog happening when we were there. We were all hungry after our walk, so we drove back into the Presidio and lunched at a semi-fancy place called La Terrasse. We all enjoyed our food and Little Cat A claimed it was the best French Toast she had ever eaten! 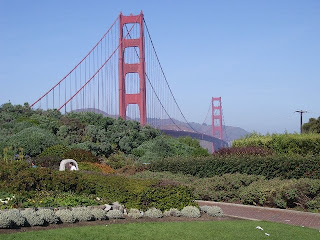 We tried to geocache a little, but realized we were too pooped to give it any real effort, so we called it a day and drove home (taking the long way through the Presidio to look at all the cool buildings). On the way home we stopped at Katrina Rozelle's and each got a piece of cake. I had the Almond Vanilla and was happy as a clam! Family Fun Week was fun and I'm ready to return to our regularly scheduled programming! Glad you stole away from the family to join us! It was great to see you!